Drownyard Temple was featured in multiple decks from last week’s Pro Tour Shadows Over Innistrad Top 8. Let’s see how this card fits into — or even helps define — the metagame. Luis Salvatto played essentially a Big Red deck (splashing for white and colorless cards). You can have played Magmatic Insight and Tormenting Voice in concert with Pyromancer’s Googles for some time… Mike hypothesizes that the “difference that makes the difference” is the printing of Drownyard Temple. “Three copies is indefensible,” says Patrick! This deck actually wants colorless! 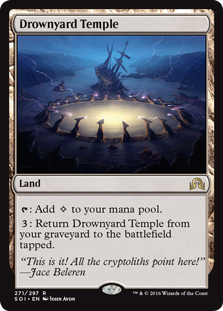 There are many lands, like Mountain, one of the two copies of Westvale Abbey, or one of the weird off-color pain lands, that can potentially make room for Drownyard Temple #4. Drownyard Temple is even better in Brad’s deck than Luis Salvatto’s! Brad has all the Magmatic Insight-esque interactions and the long-game lock with World Breaker. World Breaker becomes an infinite threat given sufficient time as long as you can keep sacrificing a land… And one land in particular can make that a consistent reality. We — and a lot of others — have been high on Oath of Nissa since it was printed (which was not that long ago). However Traverse the Ulvenwald is even better in this style of deck than Oath of Nissa! Notably Traverse the Ulvenwald can get either side of the World Breaker / Drownyard Temple combo, graveyard permitting. Fate Reforged Asks – Ginger or Mary Ann? What does Patrick Chapin’s New Year’s Eve party bus have to do with a mid-2000’s Tsuyoshi Fujita deck design? Our hosts discuss Standard – reviewing Mike’s Star City Super Invitational Qualifier Top 4, possibly in preparation of Patrick’s upcoming hometown event, Grand Prix Denver. A general discussion of the great Fate Reforged two drops Soulfire Grand Master and Jeskai Sage. Did we say “great”? Interesting discussion from Patrick turns Mike around on a previously not-loved Jeskai Sage. Editor’s Note: Patrick and Mike muse on using Soulfire Grand Master to recycle Temporal Tresspass. Temporal Trespass exiles itself so this is not a possible interaction.